One of the first behaviors I taught my horses with clicker training was to target an object. I had a jolly ball in the barn so I started with that. I taught them to touch it and to pick it up. Then I played with targeting other objects and doing different behaviors with a ball (push it, kick it, etc…). We were having so much fun with these types of games that I continued with them and taught the horses to fetch, play basketball, and pick up objects and put them in a basket. These kinds of games are often a fun way to introduce your horse to clicker training because they are new to the horse (there’s usually no previous learning history or emotional baggage) and it gives the trainer lots of chances to practice their timing and learn to split behavior down into small pieces. They are also a nice way to learn more about each individual horse. My two horses were very different. One was a little hesitant about picking up objects and I had to take things very slowly. The other was very enthusiastic but tended to add in extra behaviors so I had to teach her to be more focused. And, because I didn’t “need” this behavior, I was more relaxed about teaching it. When I decided to teach them to fetch, it seemed like a simple idea and a natural extension of what we had been doing. But the behavior that we call “fetch” is actually a good example of a “behavior chain.” There are a few definitions of behavior chains floating around out there, but the simplest one is that it is a series of behaviors that are linked together by cues, with one trainer provided reinforcement at the end. Behavior chains are important and it’s worth taking the time to recognize, understand and learn to build them. A lot of complex behaviors that seem difficult to train become much simpler if they are viewed as behavior chains. Most behaviors can be broke down into smaller pieces and once you learn to recognize simple behavior chains, you will find that you see behavior chains everywhere. Teaching behavior chains is also a good way to switch from reinforcing after each behavior to reinforcing after several behaviors. I found that exploring behavior chains taught me a lot about cues, splitting behavior and how to build and maintain and motivation. I also found that they are useful for many things and I use them for many husbandry and riding behaviors. Go to the object -> pick up object -> carry it a short distance -> give it to me. If the horse has trouble carrying the object to me, I can break it down into smaller steps by changing my position and distance relative to the horse so that he slowly learns to carry the object while turning and walking. Find something your horse is comfortable holding in its mouth. Some horses are particular about the size and/or texture of objects. If you are working on a sandy or gritty surface, the horse might not want to pick up the object after it gets wet and has dirt stuck to it. I just wipe it off between throws. It helps to carry a towel if this is an issue. If you plan to throw the object, it’s important to choose something that is easy to pick up regardless of how it lands. A lot of dog toys are designed so they land with something sticking up so they tend to work well. 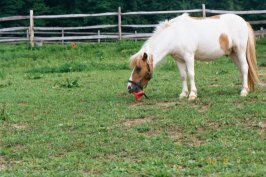 If you have a horse that already likes to pick things up and you don’t want to encourage it to pick up everything, have a few designated fetch toys and only use them. Or you can put more time into stimulus control so the behavior only happens on cue. I had a friend who taught her horse a good “pick it up” cue and she found it very useful. Carrying the object is often one of the harder behaviors so break this down into small steps and build distance slowly. I’ve also found that horses take longer to learn to track thrown objects (compared to dogs) so I spend a lot of time working at very short distances. Once your horse can pick up an object and take it to a location, there are lots of fun variations you can train. Here are some ideas: fetch to your hand, fetch to a bucket or location, play basketball (little kids plastic ones work great), clean up your toys, put away the (pretend) trash, get a Kleenex, get a drink (water bottle) for you, stack cones, get your feed pan, and anything else that involves picking up something and doing something with it. I wanted to write about fetch because I think it’s a fun game for both horse and trainer and I do get asked how to train it. It’s also a great way to introduce some more advanced concepts. It’s been a long time since I’ve done much with it, so just for fun, I took Rosie out to see what she remembered. She did great. I took a little movie of the game we played which was to put the yellow jack in the red bucket. I kept it simple because we needed to stay within view of the camera and we were in a different location (Most of her previous training was one in her stall, the aisle or her field). If I did this for a few more days, I would be able to throw the jack and have her take it to the bucket from a greater distance and in different locations. She used to be really good at fetching thrown objects. Here’s the link if you want to see how she did. I did help her a bit as the bucket is taller than normal. Do you use voice cues when training fetch for example? How do you differentiate between a touch cue and a pick up cue? You said your friend had a good ‘pick it up cue. What was it? Sorry for the delay in responding. I haven’t been on the computer much recently. I do use voice cues, but I may also use a gesture to point at the object I want. I have kept things pretty simple. I say “touch” for touch and “pick it up” for a retrieve. But I think the horses also learn which objects are more likely to be “touch” objects and which are more likely to be “pick it up” objects. I can only think of a few objects where I might sometimes ask the horse to touch it, and sometimes ask the horse to pick it up, and even then, I probably tend to cue one more than the other.